Take a four-day journey through Slovenia's sparkling emerald streams, lush forests, and striking mountains with this sample itinerary. My first journey to Slovenia began with a photograph. When perusing the Internet, I stumbled upon an image of a tiny church in the middle of a lake surrounded by mountains. I didn’t think it was real, but upon doing more research, I learned that this magical place is located in Slovenia. I promised myself I’d experience this picturesque destination for myself. Years after first seeing that photo, I finally packed my bags and spent four days in Slovenia. Situated in between Italy and Croatia, Slovenia is an unassuming country that packs a big punch. In my short trip, I mainly explored the Triglav National Park area and was blown away by its incredible beauty. With its green forests, varied landscapes, friendly people, and stunning natural landmarks, Slovenia was a feast for the eyes and the heart. There’s a lot to see and do in Slovenia within a short road trip from the capital, Ljubljana. For the average working person, it’s an awesome place to do some exploring in a short amount of time. If you’re looking for a unique European travel experience, Slovenia is a fantastic choice. Psssst…headed to Slovenia? You might enjoy one of these other posts, too! Start your day off early by heading straight to Lake Bled, which is about a 45-minute to 1-hour journey from Ljubljana. Once there, you can wander the town’s streets or take a walking loop (~3.5 miles) around the lake’s perimeter. Escape the afternoon heat by checking out Bled Castle (€10), which is situated atop a cliff overlooking the lake. You can also take a ride to the church in the middle of the lake (€14), where legend states that you can ring the bell and your wishes will come true. In the late afternoon, hike up to Ojstrica viewpoint for some of the most stunning views of Lake Bled as the sun sets over the mountains. Or, if you’re up for a longer adventure, continue onward to Mala Osojnica, which is an even higher viewpoint. Although I think the view from Ojstrica is more beautiful, it’s worth seeing the lake from both points if you have the time. End your day with some Slovenian fare at Ostarija Babji Zob, a delicious restaurant with generous portions at a decent price point. Don’t forget to taste some Slovenian wine – an affordable and delicious treat. In the morning, catch sunrise around Lake Bled. After grabbing a quick breakfast, head by foot to Vintgar Gorge, which is situated just 3 km outside of the town. On the way, you’ll pass through charming towns and winding streets – the perfect place for some photography. Once you arrive at Vintgar Gorge, pay the entrance fee (€5) and take a hike around the area. With its turquoise water, precarious passages, and steep rock walls, you could easily spend an hour or two wandering around the trails here. 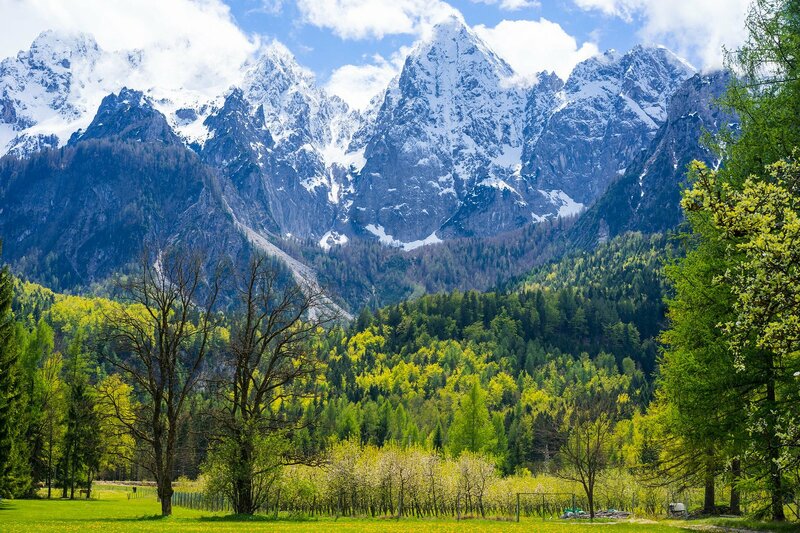 After Vintgar Gorge, head to the town of Krajnska Gora for some jaw-dropping views of the Julian Alps. There are several hiking/walking paths in between Bled and Krajnska Gora, so be sure to take your time and do some exploring on the way. The drive is just as beautiful as the town itself! Once in Krajnska Gora, grab a bite to eat at a small cafe and meander through the alleys and streets. It’s one of those places where it’s easy to forget what time it is. Incredible mountain views and charming cottages await around every turn. Wake up early to enjoy the serenity of Lake Bohinj, about 30 minutes from Bled. Surrounding this tranquil lake is a snow-capped mountain range and several tiny cabins. It’s a lovely place to spend a few hours. If you’re interested in exploring more of the lake or learning about some of the history, hop on the lake’s electric boat tour (€10) and learn about some of the mythology of Lake Bohinj. In the evening, head back to Ljubljana (~1.5 hours) or return to Bled for a final night. Start your morning with breakfast in the city. Then, go to the front of the pink church in Prešeren Square at 11 AM for a free city walking tour, which will take you through some of the main highlights of Ljubljana. You’ll venture through the main city squares and bridges and see many of the city’s historic buildings. All you’ve got to do is tip the guide at the end! Afterward, check out Ljubljana Castle (€7.5), which sits on a stunning viewpoint overlooking the entire city. Following your mini-hike, enjoy some ice cream at Cacao. In the afternoon, enjoy a boat ride in the canal (€8), try out some of the best foods in Slovenia, or check out one of the city’s museums. There are several art museums (National Gallery, Museum of Modern Art, etc. ), the National Museum, and the Museum of Illusions, to name a few. In the evening, taste some Slovenian lamb dumplings or goulash. There are several amazing day trips from Ljubljana that you can take. In one day, you can visit Predjama and Postojna. Predjama is a unique stone castle carved out of a cliff, located about one hour away from Ljubljana. Postojna Caves are located close to Predjama, and are a stunning natural highlight of Slovenia. Another interesting excursion is Škofja Loka, a charming medieval town located close to the capital. If you have a few more days, it’s worth exploring around northern and eastern Slovenia, as well as the coastal area near Piran. I Feel Slovenia – The national tourism board’s website, which is chock full of resources on logistics for planning your trip. Hiking to Ojstrica Viewpoint – A how-to guide on hiking the Ojstrica viewpoint in Lake Bled. Slovenia Archives – All of the resource posts on Slovenia available on this site.